Waited until the last minute? 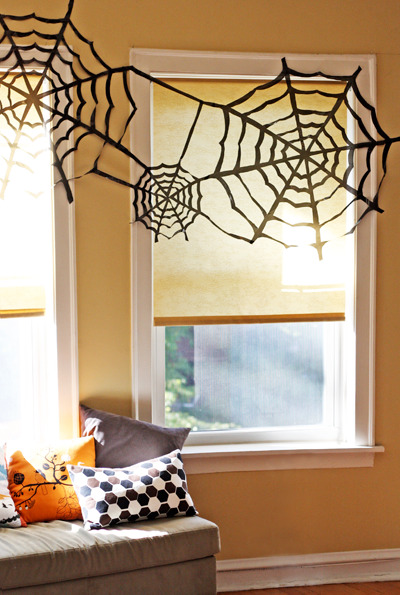 Give your home-sweet-home a decidedly devilish air with these easy do-it-yourself Halloween decorating ideas. 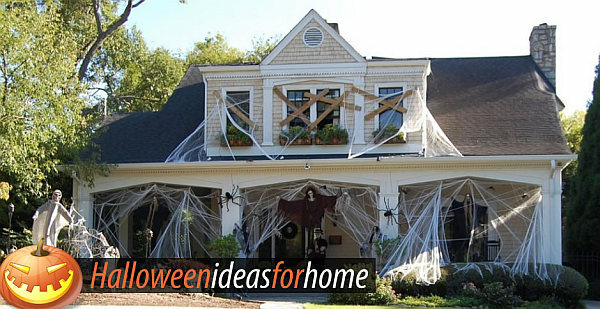 PLUS: See more spooky and creative Halloween craft projects and charming outdoor Halloween decor! 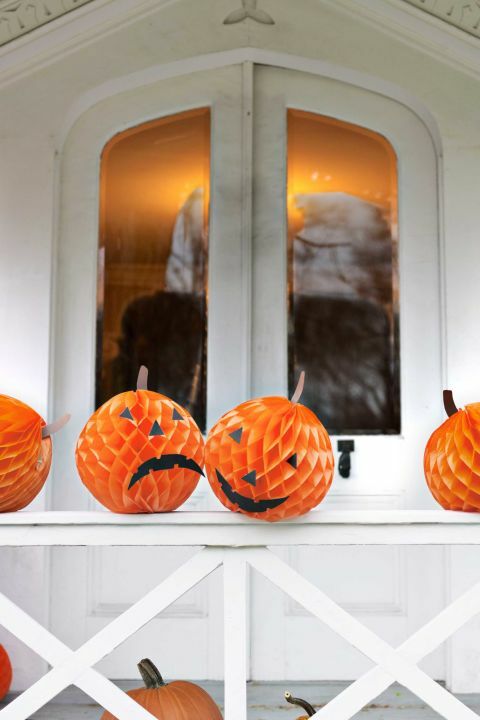 Turn orange tissue-paper balls into proper Halloween pumpkins that can line your front porch. Simply cut facial features and stems from construction paper and apply to the balls with glue dots. 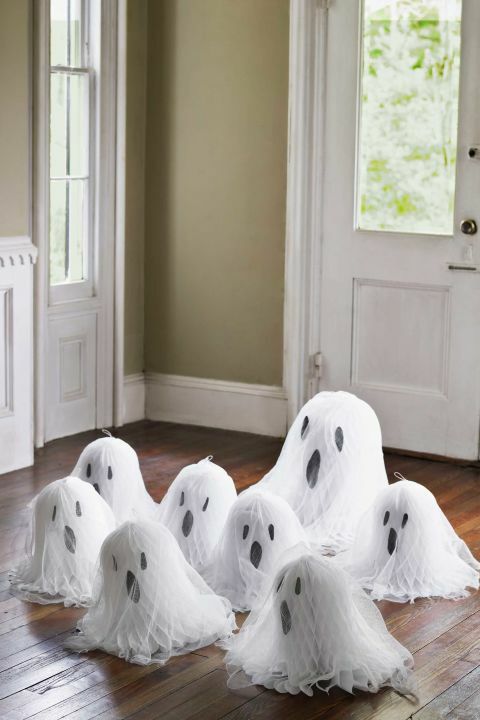 To call forth this gathering, use glue dots to stick construction-paper eyes and mouths onto white tissue-paper bells, then drape them with cheesecloth. Take typical harbingers of good cheer to the dark side. 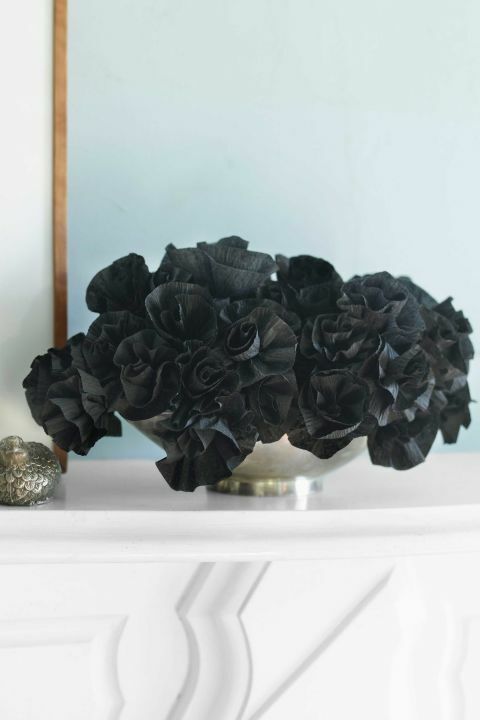 This shadowy floral arrangement is made from inexpensive crepe-paper streamers. 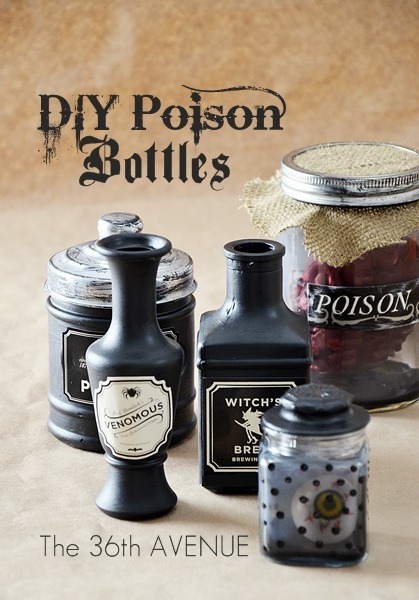 Desirée of The 36th Avenue used dark glass stain and chalkboard paint to transform ordinary glass bottles into witches' poisons. 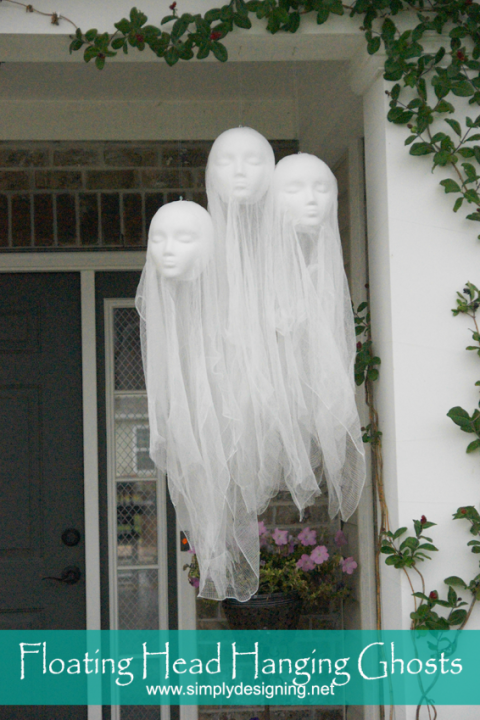 Foam mannequin heads and cheese cloth are the keys to these creepy porch decorations by Ashley Phipps of Simply Designing. 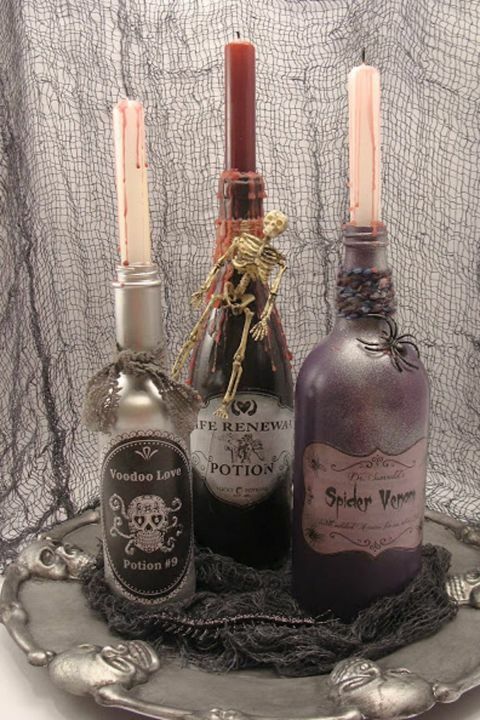 Mother and daughter team Jeanette and Leigh of Crafty in Crosby spray painted wine bottles of varying sizes, and added labels, twine, candle wax, and plastic toys to make these spooky potion vessels. 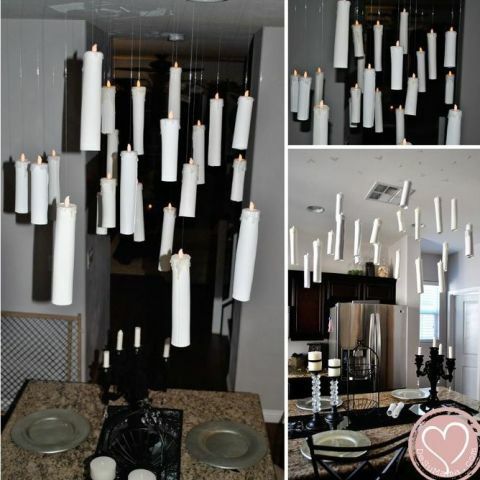 Spray paint cardboard rolls and affix battery-operated tea lights to the tops for these wizardry candles. See more at De Su Mama and Harry Potter Party Ideas. Jessica of How About Orange created these beautiful, dramatic spider webs out of black garbage bags. To make your own, you'll need a black Sharpie, a pair of scissors, some tape, and these instructions. Make washing your hands a scary affair. 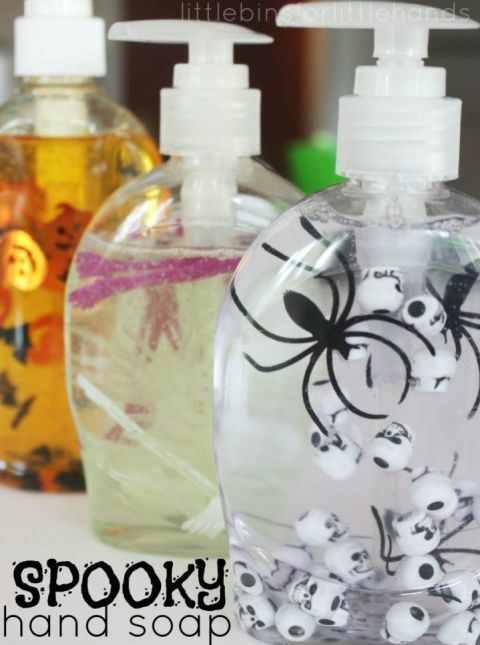 Simply add Halloween items to your favorite hand soap — we suggest small pumpkin, bats, eyeballs, or spiders — and stir with skewers. Get the tutorial at Little Bins For Little Hands. 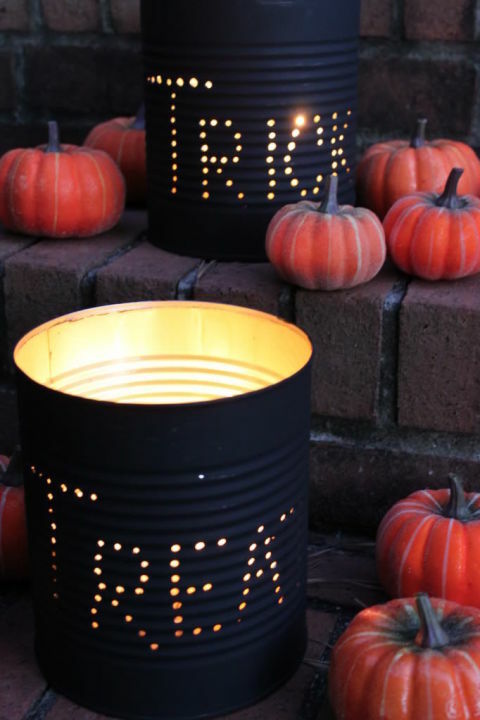 For an easy and affordable way to decorate your home this Halloween, make luminaries using paint, candles, and empty tin cans. Get the tutorial at Jolly Mom. For this easy Halloween project, prime five pumpkins, spray paint three white and two black, and drill 1" holes into each. 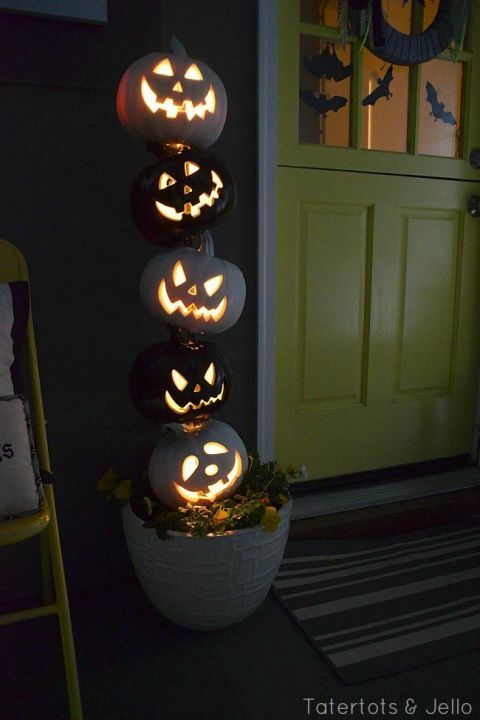 Alternating colors, place the pumpkins onto a dowel that stands in the middle of a flower pot. Thread lights through for a top-notch topiary. 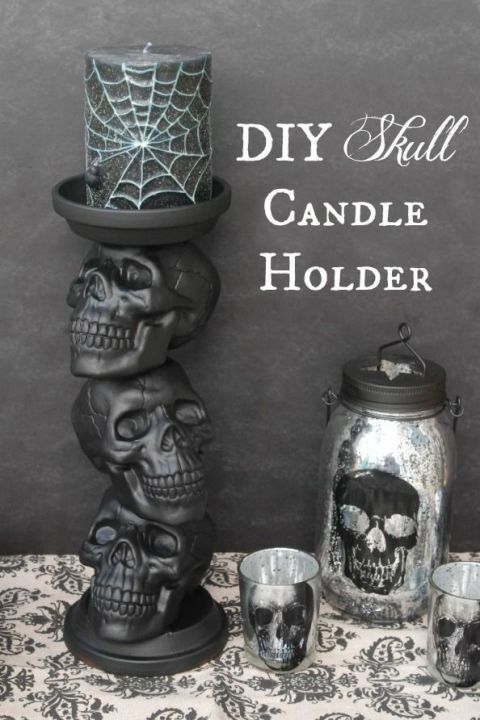 With a little spray paint and a hot glue gun, you can turn plastic skulls and two terracotta saucers into a candle holder that screams Halloween. Get the tutorial atEndlessly Inspired. 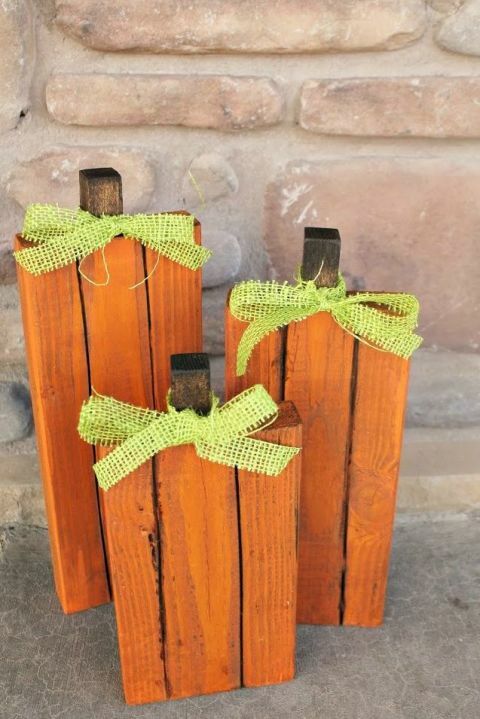 These fun bundles are easy to make with orange tissue paper and green tape. 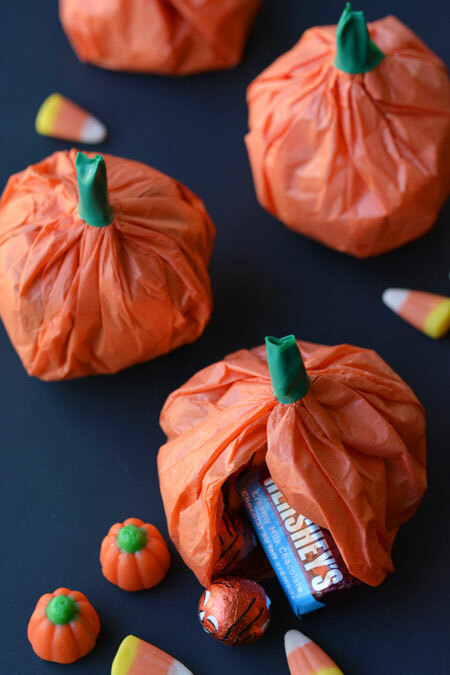 Cut the tissue paper into circles, place your favorite assorted candy in the center, and gather the edges until you've pinched together a perfect pumpkin. Wrap green tape around the twisted end of the pumpkin top. Even your booze needs decorating. 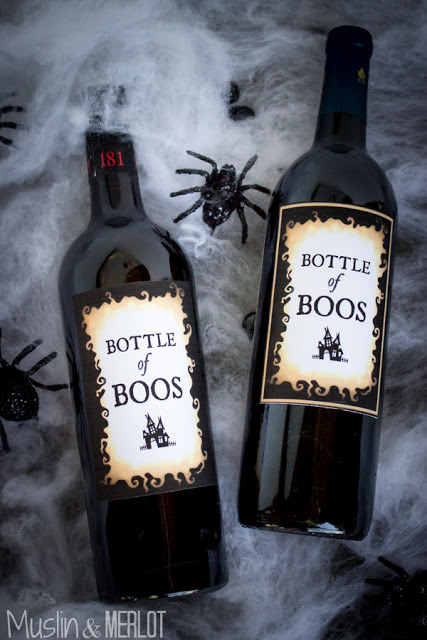 Paste on printable wine tags with double-sided tape to make this clever bottle craft. Get the tutorial at Muslin and Merlot. Here's a crafty and creative way to reuse your K-cups after a morning's cup (or five). 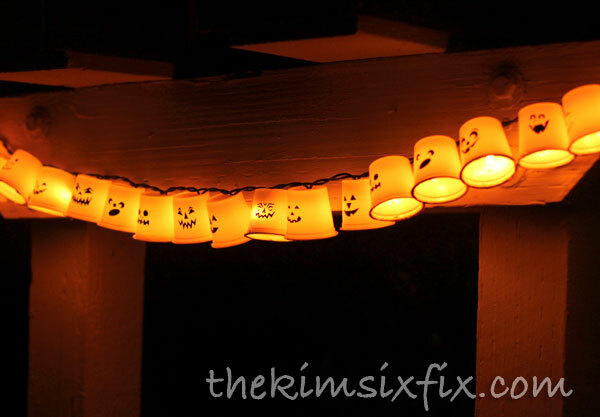 Dollar store string lights and a Sharpie makes this Halloween project cost only $1. Get the tutorial at The Kim Six Fix. 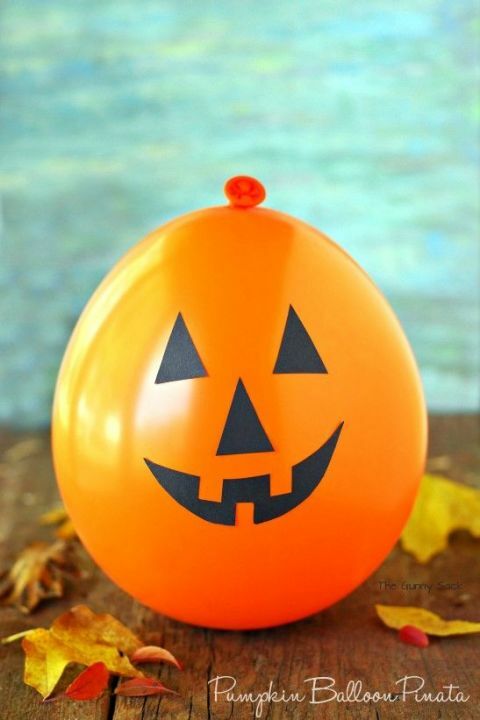 Decorate your house a little differently this year with something other than your ordinary pumpkins. Get the tutorial at Family Food Fun. Fill these pumpkin piñatas with candy and hand out to trick-or-treaters for a fun-filled goody they'll be eager to break open. Get the tutorial at The Gunny Sack. 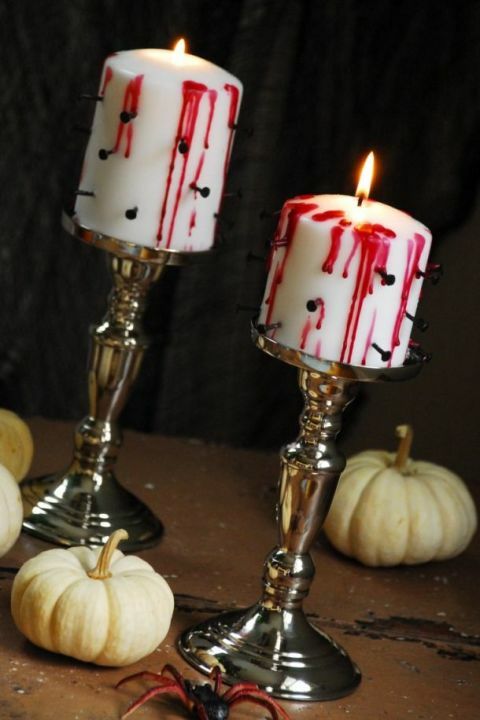 Pierce ordinary candles with black carpet tacks and drip red wax down the sides for tortured candles that take only five minutes to make. Get the tutorial at Family Chic. 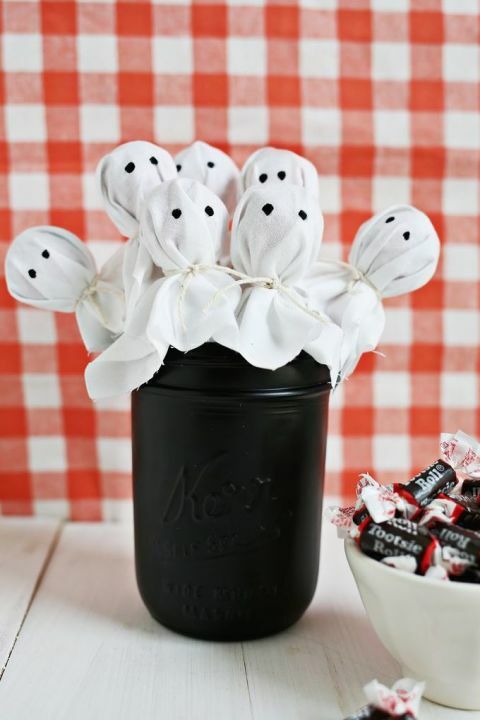 Drape white cotton over lollipop candies, tie with twine, and paint on black eyes for this ghostly edible centerpiece.